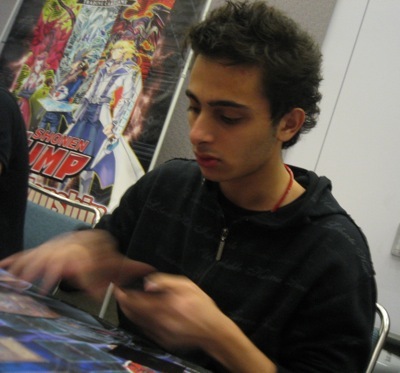 Yassine Ali came here from Montreal and is running a Twilight Deck with “Tragoedia” in it in today’s tournament. 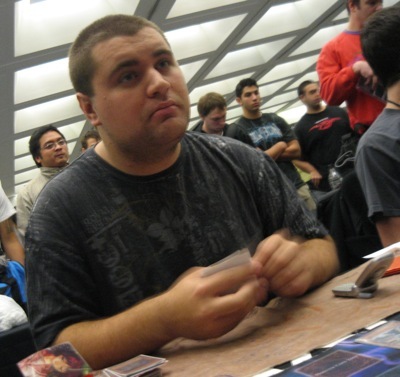 Kris Ferber is the current U.S. National Champion and traveled here from Albany, New York with his Lightsworn Deck. This is sure to be a great Match. Ali won the dice roll and chose to go first. He opened with “Dark Armed Dragon,” “Jain, Lightsworn Paladin,” “Charge of the Light Brigade,” “Necro Gardna,” “Honest” and “Judgment Dragon.” He activated “Charge of the Light Brigade” sending “Lumina, Lightsworn Summoner” and 2 copies of “Chaos Sorcerer” from the top of his Deck to his Graveyard as a cost. He searched his Deck for “Lumina, Lightsworn Summoner” with Charge’s effect and added it to his hand. Then he Summoned “Lumina, Lightsworn Summoner” and discarded Jain to Special Summon Jain back from his Graveyard. He sent “Necro Gardna,” “Judgment Dragon,” and “Lyla, Lightsworn Sorceress” to his Graveyard in his End Phase, along with 2 other cards, thanks to the effects of Lumina and Jain. Play passed to Ferber, who started things off by activating “Gold Sarcophagus” and removing “Judgment Dragon” from his Deck. In 2 more turns, he would be able to add it to his hand. Then he activated “Charge of the Light Brigade” by sending a “Wulf, Lightsworn Beast” to the Graveyard as part of the cost. He searched his Deck for “Aurkus, Lightsworn Druid” to add to his hand and then Special Summoned Wulf to the field. Then he Normal Summoned Aurkus and used it to attack Lumina. Ali dropped “Honest” from his hand to save it and destroy Aurkus. Ferber dropped to 7000 Life Points. Ferber ended his turn without attacking with Wulf. Ali drew “Tragoedia” next turn. He attacked Wulf with Jain. Jain gained 300 ATK and both monsters were destroyed. Then Lumina attacked directly and Ferber dropped to 6000 Life Points. Ali sent a “Ryko, Lightsworn Hunter” and 2 other cards to his Graveyard in his End Phase with the effect of Lumina. Ferber began his next turn by activating “Charge of the Light Brigade,” sending “Necro Gardna” to the Graveyard as part of the cost. He searched his Deck for “Lumina, Lightsworn Summoner” with Charge’s effect and added it to his hand. Then he Normal Summoned “Lumina, Lightsworn Summoner” and discarded a Lyla with her effect to Special Summon Aurkus back from the Graveyard. Ferber attacked Lumina with Aurkus but Ali stopped the attack by removing a “Necro Gardna” from his Graveyard. Ferber ended his turn. He sent 3 Lightsworn monsters and a “Plaguespreader Zombie” to his Graveyard in his End Phase. On Ferber’s next turn, he drew a card and then retrieved “Judgment Dragon” from his removed-from-play zone. Then he Special Summoned “Judgment Dragon” and paid 1000 Life Points to destroy everything on the field. Next he activated “Foolish Burial” to send a “Judgment Dragon” from his Deck to his Graveyard. Ferber followed up by setting one back row and ending his turn. He sent 4 more cards from the top of his Deck to the Graveyard in his End Phase. Ali drew “Charge of the Light Brigade” next turn. Then he Special Summoned “Dark Armed Dragon”! He removed a DARK monster from his Graveyard to Destroy Ferber’s “Judgment Dragon” and then removed another DARK monster from his Graveyard to target Ferber’s face-down Spell or Trap Card. Ferber chained “Beckoning Light” to discard the 2 cards in his hand and return his 2 copies of “Judgment Dragon.” Ali activated “Charge of the Light Brigade” next and sent a Wulf to the Graveyard as part of the cost. He searched his Deck for Lyla and added it to his hand. Then he Special Summoned his Wulf to the field. Next, he activated “Monster Reincarnation” and discarded a card from his hand to retrieve “Judgment Dragon.” Ferber immediately conceded, knowing he couldn’t stand up against all of the attacks of all Ali’s monsters. Ferber will be going first in the second Duel. Both players Side Decked and play began shortly after. He started his turn by Summoning Lumina to the field and sending a Wulf plus 2 other cards to his Graveyard in his End Phase. He Special Summoned the Wulf to his field and play passed to Ali. Ali started off with “Solar Recharge,” “Lumina, Lightsworn Summoner,” “Plaguespreader Zombie,” “Lightning Vortex,” “Judgment Dragon,” and “Tragoedia.” He activated “Solar Recharge” first, by discarding Lumina. He drew “Honest” and Celestia, sending “Tragoedia” and “Dark Armed Dragon” afterwards. Ali ended his turn with no other play and no cards on the field. Ferber drew a card and then activated Lumina’s effect by pitching “Necro Gardna” from his hand. He Special Summoned Aurkus in Attack Position. Lumina and Aurkus attacked and Ali dropped to 5800 Life Points. Wulf followed up with an attack and Ali dropped to 3700 Life Points. Then he decided to Special Summon “Tragoedia” from his hand in Defense Position! Feber ended his turn, sending Celestia, “Judgment Dragon,” and 3 Spell and Trap Cards from the top of his Deck to his Graveyard. Ali drew “Allure of Darkness” next turn and activated it. He Drew “Charge of the Light Brigade” and “Jain, Lightsworn Paladin” before removing “Plaguespreader Zombie” from his hand. He activated Charge, sending “Necro Gardna,” Lyla, and “Royal Oppression” to the Graveyard to pay for its cost. He searched for “Lumina, Lightsworn Summoner” with the effect of Charge and added it to his hand. Next he activated “Lightning Vortex” by pitching Jain as a cost, and all 3 of Ferber’s monsters were destroyed! Ali switched “Tragoedia” to Attack Position next. Since Ali had 4 cards in his hand, it had 2400 ATK. Ali Summoned “Lumina, Lightsworn Summoner” and attacked with it. Then he attached for 1800 with “Tragoedia.” Ferber took both attacks and dropped to 5200 Life Points. He sent 3 Spell and Trap Cards to the Graveyard in his End Phase with Lumina’s effect. The Duel stood with “Honest,” “Judgment Dragon,” and “Celestia, Lightsworn Angel” in Ali’s hand and “Tragoedia” and Lumina on his field. Ferber had 6 cards in his hand with no field. Ferber drew for turn and then activated “Charge of the Light Brigade.” He sent 2 copies of “Bottomless Trap Hole” and a “Solar Recharge” from the top of his Deck to his Graveyard and then searched his Deck for “Garoth, Lightsworn Warrior” to add to his hand. He Summoned Lumina next and discarded Garoth to Special Summon a second copy of Lumina from his Graveyard. Then he discarded Wulf to Special Summon Garoth using the effect of Lumina once again. Garoth attacked Ali’s “Tragoedia” and Ali let it get destroyed. Then Ferber attacked Ali’s Lumina with his own and passed priority in the damage step. Ali dropped “Honest” and Ferber’s Lumina was destroyed. He took 1000 damage. In Ferber’s End Phase, he sent 5 cards from the top of his Deck to his Graveyard, including a “Plaguespreader Zombie.” He also drew 1 card for Garoth’s effect. Ali Tributed Lumina for Celestia next turn and sent 4 Spell and Trap from the top of his Deck to his Graveyard to activate its effect. Both of Ferber’s monsters were destroyed! Then Ali attacked with Celestia, but Ferber stopped the attack with “Necro Gardna.” Play passed back to Ferber. Ferber drew a card and then Special Summoned Aurkus to the field. He used “Aurkus, Lightsworn Druid” to attack Celestia, but Ali blocked the attack with “Necro Gardna.” Ferber ended his turn and sent “Judgment Dragon” and “Tragoedia” from the top of his Deck to his Graveyard in his End Phase. Ali drew “Heavy Storm” next turn. The score stood with Ali at 3650 and Ferber at 4200 Life Points. Ali used Celestia to attack Aurkus and Ali dropped “Honest” in the Damage Step. Aurkus was destroyed and Ferber dropped to 1900 Life Points. Ali ended his turn. After drawing for turn, Ferber Summoned “Honest” to the field and then put a card on top of his Deck to Special Summon “Plaguespreader Zombie” from his Graveyard. He Tuned his 2 monsters together to Synchro Summon “Goyo Guardian.” “Goyo Guardian” attacked Celestia and Ferber stole it after dropping Ali to 3150 Life Points. Ali drew Kycoo next turn. He Summoned it to the field and attacked Celestia, destroying it. Then he Special Summoned “Judgment Dragon”! Celestia was the 4th Lightsworn that he needed in the Graveyard to Summon his “Judgment Dragon”! In his End Phase, he sent to the Graveyard 4 cards with “Judgment Dragon’s” effect. Ferber drew “Solar Recharge” next turn and activated it. He discarded Celestia to draw 2 cards and send Lyla and Celestia from the top of his Deck to his Graveyard. Then he Set 1 card to his Spell and Trap Zone and ended his turn. Ferber Special Summoned “Judgment Dragon” next turn and then paid 1000 Life Points to destroy everything on the field. He followed up by Summoning Garoth in Attack Position. Both of his monsters attacked, but both attacks were negated by Ali’s 2 copies of “Necro Gardna” in the Graveyard. Ferber sent 4 cards from the top of his Deck to his Graveyard in his End Phase. Ali drew “Chaos Sorcerer” next turn! He Special Summoned it in Defense Position by removing “Honest” and Kycoo from his Graveyard. Then he activated its effect to remove Ferber’s “Judgment Dragon” from the game. Ali ended his turn. Ferber drew the last card in his Deck on his next turn. It was “Soul Release.” With only a Garoth on the field and an “Honest,” “Soul Release,” and “Charge of the Light Brigade” in his hand, Ferber couldn’t deal enough damage to Ali to finish off his last 1650 Life Points. He would be unable to draw next turn and couldn’t win. Ferber conceded and Ali took the Match. After a 2-0 victory over the U.S. National Champion, Yassine Ali moves on in the tournament with a great shot at making the Top 16 cut! In Duel 2, Ferber attacked Celestia with Aurkus, telegraphing to Ali that Ferber had an “Honest” to boost the ATK of his Aurkus. To prevent that, Ali removed “Necro Gardna” from his Graveyard to negate the attack. On Ali’s next turn, he was able to attack Ferber’s Aurkus with Celestia and know to drop his own “Honest” during damage calculation to make sure his monster won the battle, even if Ferber used an “Honest” of his own. These were great moves made by Ali, who was able to control the Battle Phase and play around “Honest” in order to keep his Celestia on the field. During the second Duel, Ali attacked Ferber’s Aurkus with Celestia, and dropped “Honest” first in the damage step. Because of the way that “Honest” works against another “Honest,” whichever “Honest” was played first will be the last to resolve on the Chain. This means that it gets the boost the other player got from their “Honest” as well as its own, and will destroy the opposing monster in battle. By dropping his “Honest” first, Ali made sure that he was going to get that attack through and deal 2300 points of damage to Ferber. Ali made the right decision as next turn, Ferber Summoned the “Honest” he was holding in his hand, which would have saved his Aurkus if Ali passed priority.